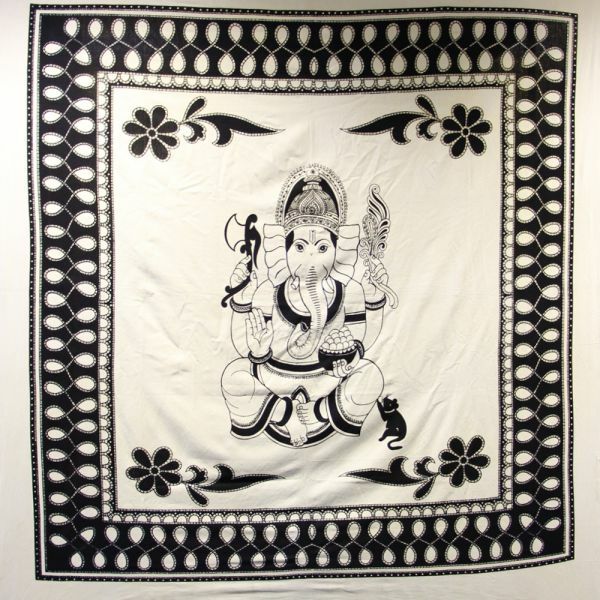 The Black & White Ganesha Bedspread is the perfect accessory to instantly transform your bedroom into a relaxing and spiritual space. This hand printed design is made from heavy cotton and is big enough to cover a double bed, or alternatively used as a throw or wall hanging. Ganesha is one of the best known deities in Hindu culture and is revered as the remover of obstacles and is instantly recognisable by his elephant head. This bedspread measures approximately 2020mm x 2346mm. The Black & White Ganesha Bedspread is available now for just £14.99, but if you are looking for something different we have a huge range of different bedspreads from Celtic Knots and Zodiac designs, to Bob Marley and Peacock patterns. Please note that the design may vary from the picture below due to the pattern being hand printed and unique. If you are a fan of the great singer and songwriter Bob Marley and who isn’t not may we imagine as he sold a record of more than 75 million records. A committed Rastafarian that you could sense in his music and sense of spirituality, he was a great campaigner to legalise cannabis which he believed was a sacrament and an aid to healing. He sadly died at an early age of just 36 years, but we have lots of items bearing the image of the great man, including lighters, cigarette tins, bedspreads and even your own rolling papers! One of our most popular items is the handmade bedspread, which is generous 2m 23cm x 2m 4 cm. Made form 100% cotton and suitable for most double beds, the hand printed image on the face is of the great man himself. The Bob Marley bedspread itself is a genuine handmade item that embodies the hand weaving and fabric-painting arts that have been handed down through generations in parts of India. By selling these items we help to ensure a livelihood for indigenous craftspeople and their families as well as to preserve hand-dyeing, hand-block printing in India. Naturally because the item is handmade as well as hand printed, the finish may vary slightly from the picture at our web page. Embodying techniques that have been passed down through generations of grass-roots artisans, our hand printed bedspreads are certain to not only brighten up any bedroom, but they will help to ensure a livelihood for indigenous craftspeople and their families as well as to preserve hand-dyeing, hand-block printing, hand weaving and fabric-painting arts in India. We have many examples of traditional hand printed bedspreads and perhaps some the most popular ones is the collection of Buddha bedspreads. These depict the Buddha sitting in the lotus position seen as the traditional union of wisdom method. We have five colours from which you can choose and the colour reference of thecircle surrounding the Buddha. The bedspreads are a generous 2080mm by 2354mm and are sure to be a warm cosy addition to your bedroom, manufactured from heavy cotton. 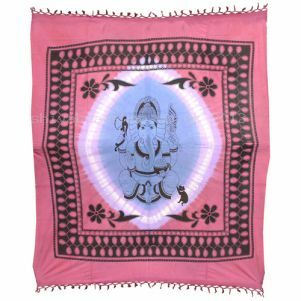 There are many others which depict traditional Indian culture, the Lord Ganesh collection are in four warm colours, again made from 100% cotton and tradition has it that Ganesh is the remover of obstacles and the bringer of good luck. What could be better than to have this spiritual icon on your bed? Naturally as all these items are hand printed; they can vary in colour from the pictures on our web pages. Also it is possible to see the occasional double printing, but remember these are not mass produced computerised factory items and are naturally bright, colourful and beautiful. 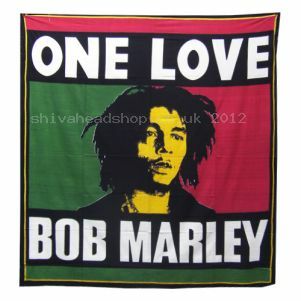 One of most popular items here at Shiva Online is our Bob Marley bedspread. The world famous Jamaican singer-songwriter is an icon for many people. As a committed Rastafarian we at Shiva and many of our fans hold him dear to their hearts. Born Robert Nesta Marley, he grew up with Neville Livingston (later known as Bunny Wailer) the pair played music together and formed a vocal group together with Peter Tosh, Beverley Kelso and Junior Braithwaite. Following local success with the vocal group during which time Marley also learned to play the guitar, Bob Marley and the Wailers were formed by Bob Marley, Peter Tosh and Bunny Wailer. The group found considerable success with their stand out reggae style and made Bob Marley a household name. In the late 70’s Marley relocated to the UK and recorded two of his most popular albums, Exodus and Kaya. His album Exodus was in the UK charts for fifty-six consecutive weeks. During his life Marley was always fighting for equal treatment, from his home country Jamaica to Africa. He showed his support for peace through much of his music. On 11th May 1981, Bob Marley died aged 36 of melanoma cancer at Cedars of Lebanon Hospital in Miami. He was on his way back to Jamaica from Germany when he took a turn for the worst. His final words to his son Ziggy were “Money can’t buy life.” On 21st May 1981 Bob Marley was given a State funeral in Jamaica which combined both elements of Ethiopian Orthodoxy and Rastafari tradition. As you can understand Bob Marley had a huge impact musically on many people’s lives and was considered one of the best guitar players of the 20th century. He is regarded in high esteem, despite some of the more controversial aspect of his life. Our Bob Marley bedspread is ideal for fans of this influential singer and songwriter and will look great in the home. We stock a wide and eclectic range of bedspreads at Shiva Online, they are a great finishing touch to any bedroom, whether you use it on your bed or hang it proudly on your wall. Here at Shiva Head Shop we have a great range of bedspreads which are perfect for making a statement in any room. Choose from over 10 interesting designs including printed fish, Bob Marley, Buddha and Celtic Mandala, and show your bright side. These bedspreads look great on a bed or equally as good as a throw over a sofa or hung on a wall for decoration; there is no end of uses for these bedspreads. These colourful bedspreads are handmade and hand printed in India using traditional techniques so every one is unique in colour and design. Bedspreads make the perfect gift for a loved one and each one measures approximately 2100 x 2300mm making them useful in just about any room in the house. Perfect for any Bob Marley lover, the Bob Marley Bedspread makes a bold and colourful statement of musical preference. Made from 100% cotton and hand printed using traditional techniques, the Bob Marley Bedspread can also be used as a fashionable sofa throw or hung on the wall to create a focal point in any room. These bedspreads measure 223cm x 240cms and will cover any double bed. The Bob Marley bedspread is available now for just £22.99 and makes a perfect gift for Reggae music lovers. Not a fan of Bob Marley? Then why not check out the other bedspreads on offer including the Buddha Bedspread and Celtic Mandala Bedspread. Please note: due to the traditional hand printing techniques colour may vary slightly from the picture. Buddha Bedspreads are ideal for those who want to make a statement in their bedroom, but they can also be used as sofa throws, wall decorations or a handy blanket to cover you with while you’re watching TV. 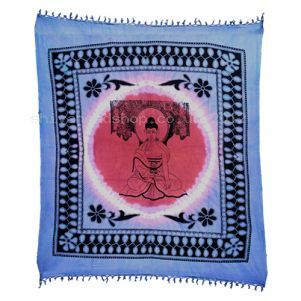 These bright and colourful bedspreads are adorned with the image of Buddha and come in a range of different colours. Made from strong and durable cotton, the Buddha Bedspread measures 2080mm by 2354mm and are hand printed in India, so each one is unique. When choosing the colour, please note that the colour refers to the circle that surrounds the Buddha print. Buddha Bedspreads are available now for £22.99 each and make ideal gifts for the spiritual people in your life. 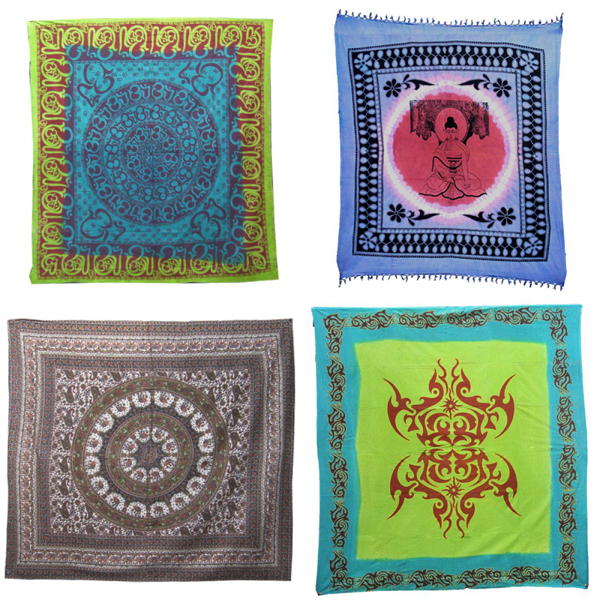 Other bedspread patterns are available including Ganesh, Peacock Mandala and Tattoo Print.